Workability of concrete is the property of freshly mixed concrete which determines the ease and homogeneity with which it can be mixed, placed, consolidated and finished’ as defined by ACI Standard 116R-90 (ACI 1990b). 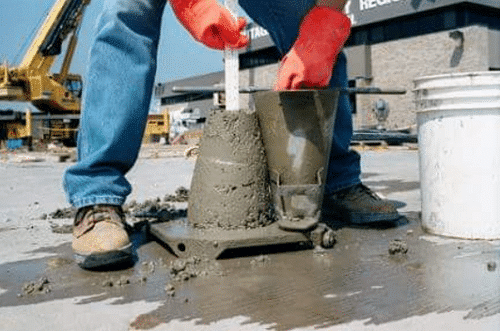 ASTM defines it as “that property determining the effort required to manipulate a freshly mixed quantity of concrete with minimum loss of homogeneity”. The workability of concrete depends on many factors which are explained in factors affecting workability of concrete. Water cement ratio has much effect in the workability. Workability is directly proportional to water cement ratio. An increase in water-cement ratio increases the workability of concrete. An unworkable concrete can also be called as harsh concrete. It is a concrete with very little amount of water. The hand mixing of such concrete is not easy. Such type of concrete has high segregation of aggregates as cement paste is not lubricated properly to stick to the aggregates. It is very difficult to maintain the homogeneity of concrete mix and compaction of concrete requires much effort. Water cement ratio of such concrete is below 0.4. This type of concrete workability is used in most of the construction works. This concrete is relatively easy to mix, transport, place and compact without much segregation and loss of homogeneity. This type of concrete workability is generally used in all concrete construction with light reinforcement (spacing of reinforcement is which allows the concrete to be compacted effectively). Water cement ratio for medium workable concrete is 0.4 to 0.55. A highly workable concrete is very easy to mix, transport, place and compact in structures. Such concrete is used where effective compaction of concrete is not possible or in mass concrete. Such concrete flow easily and settle down without much effort. But there is high chances of segregation and loss of homogeneity in this case. The coarse aggregates tend to settle at the bottom and the concrete paste comes up. Such concrete is used in case of heavy reinforcement is used where vibration of concrete is not possible. Example of highly workable concrete is self-compacting concrete. Water cement ratio of such concrete is more than 0.55. Workability requirement of concrete varies with each type of construction and compaction method used. For example, concrete workability required for a slab construction can be same as a mass concrete footing construction. Workability requirement when vibrators are used for construction are different from when vibrators are not used. Similarly, concrete workability used in thick section is not workable when used in thin sections. 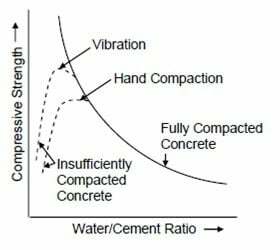 As you can see from figure, the strength of concrete decreases with increase in water cement ratio. The increase in water cement ratio indicates increase in workability of concrete. Thus, the strength of concrete inversely proportional to the workability of concrete. The reason for this relation is that water from the concrete dries up and leaves voids when setting of concrete occurs. The more the water is, the more will be the number of voids. Thus, increase in number of voids decreases the compressive strength of concrete. Thus it is important to balance the strength and workability requirement for concrete work. The workability of concrete can be enhanced by use of rounded aggregates and by the use of workability enhancing admixtures. With the use of admixture such as air-entraining admixtures, the workability in increased without increase in water-cement ratio. This helps in attaining required strength and workability for concrete work.